The U.S. Navy’s only forward-deployed carrier began sea trials on May 8. The U.S. Navy nuclear-powered Nimitz-class aircraft carrier USS Ronald Reagan has departed Yokosuka naval base in Japan on Monday to conduct sea trials, the final phase of its maintenance period, U.S. Pacific Command notes in a May 8 press release. “During sea trials, Ronald Reagan’s crew will undergo multiple training and qualification exercises to include engineering and medical drills as well as air, flight deck, and hangar bay operations to evaluate the performance of Sailors and their departments,” the statement reads. The USS Ronald Reagan is slated to replace the Carl Vinson Carrier Strike Group (CSG), which deployed to the Pacific in January and was redirected toward the Korean Peninsula in April. The Carl Vinson CSG includes the Nimitz-class aircraft carrier USS Carl Vinson (CVN 70), the Arleigh Burke-class guided-missile destroyers USS Wayne E. Meyer (DDG 108) and USS Michael Murphy (DDG 112), and the Ticonderoga-class guided-missile cruiser USS Lake Champlain (CG 57). As I reported yesterday, the USS Lake Champlain collided with a South Korea fishing vessel off the Korean Peninsula on May 9. Damage assessments are currently. However, both ships were able to navigate under their own power after the collision. The USS Ronald Reagan is the U.S. Navy only forward-deployed carrier and is homeported at Yokosuka Naval Base in Japan’s Kanagawa Prefecture. The carrier’s departure from the naval base on Monday marks the first time the ship has been underway since completing her 2016 patrol on November 21, 2016. 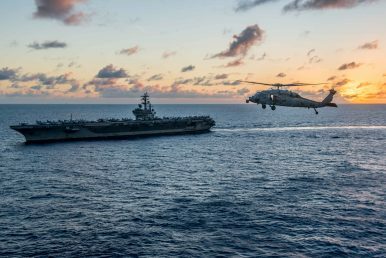 During the patrol, the carrier participated in a number of exercises including Valiant Shield, Keen Sword, and Invincible Spirit. The respective exercises aimed to enhance joint military operations with allied navies in the region, in particular the Republic of Korea Navy and Japan Maritime Self Defense Force. The USS Carl Vinson has also participated in a number of exercises with regional allies over the last few months. For example, “the carrier strike group participated in the Republic of Korea-United States Combined Forces Command eight week-long Foal Eagle exercise, a series of military drills conducted by U.S. and South Korean air, ground, naval, and special operations forces,” I reported in April. The USS Carl Vinson also deployed to the South China Sea earlier in the year. The US Navy’s only forward deployed carrier in the Asia Pacific commenced operations on May 16.